Until May 2009 I had not appreciated that Singapore balls existed, that is, until I watched a very interesting and informative demonstration by Bob Chapman. With that in mind, and having also seen the work of David Springett, my interest grew. I knew I just had to have a go at making one. To try and improve on the methods used by either of those gents would be pointless and futile, so my only reason for penning this narrative is to describe the process that I have found works best for me, and at the same time, if it encourages others to have a go it will have been a useful exercise. For me, the real interest is the technical challenge, and watching the look that spreads over the face of people as they try to figure out how the piece has been made can add a significant level of entertainment. 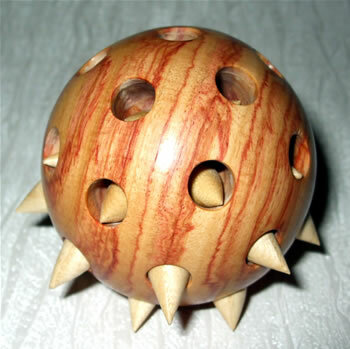 Singapore balls have the look of a medieval mace head, whereas in reality, the points retract back into their holes upon contact. As the ball is moved, the points on the underside fall forwards, whilst those on the upper surface retract, and are almost hidden. A large ball takes about 7 hours to complete, whereas a small one can be done in about 3 hours. For those who are interested, I have created a PDF document describing the process of making a Singapore Ball. It can be viewed or downloaded here. 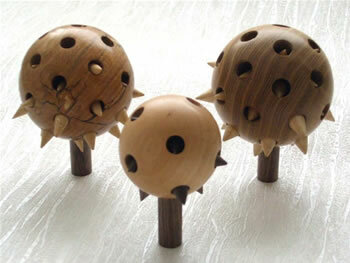 That article was featured in the December 2010 edition of "Woodturning", and is reproduced here by kind permission of Mark Baker. In that article I asked that if anybody made a ball, I would be interested to see the results, and below I have reproduced the feedback I received. Well, I did it - and here's a picture to show you as asked for. 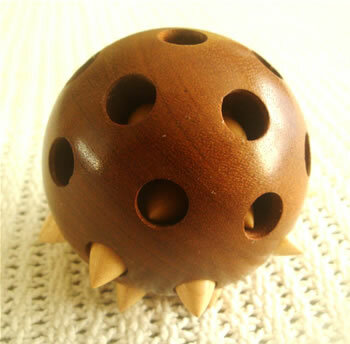 The ball is about 70mm diameter and made of Sapele whilst the points are from Maple. Many thanks for the advice and help. Top tip of yours for me was to use the hole that's being worked on to burnish the point being made giving a clear indication of the amount needed to be removed. Great project and a wonderful challenge. 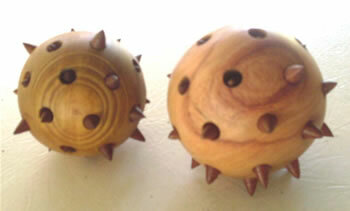 I had a great time making these balls and I am sure they won't be the last that I make.